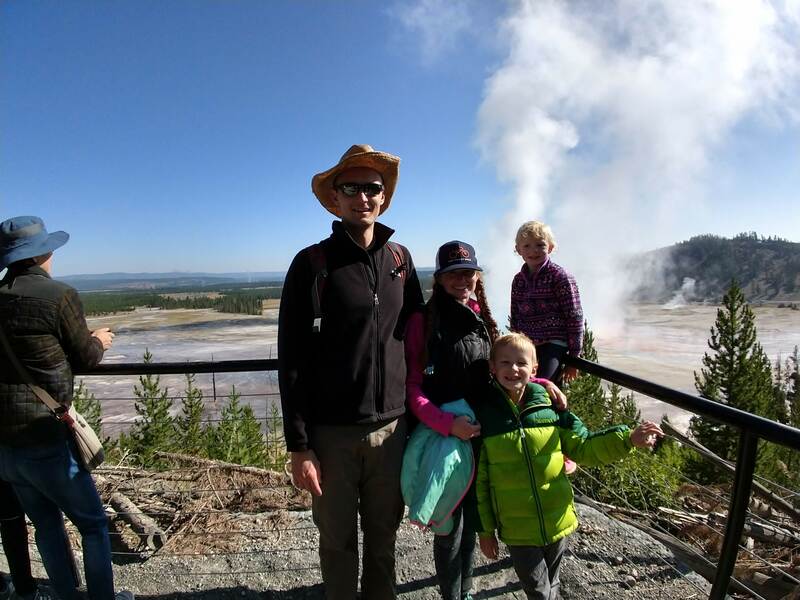 Our big summer trip this year was a trip to Yellowstone and Grand Tetons. We booked our Yellowstone campsite months ago, put it on the calendar, and then just kind of got distracted by other things. When we were debating whether to rent a pavilion for our cheesecake party, Noel and I made a pros and cons list and enumerated the reasons why it was a good idea. One of our biggest reasons would be that our house wouldn’t be destroyed by 40 guests, many of which were children. I mentioned that this was an especially important pro since we would be leaving for Yellowstone later that week. Noel said, “No, we really aren’t going next week are we?” He was sure I had the date wrong and that our trip wasn’t that soon. But it was. Luckily, we had some reliable resources to help us plan a good trip. 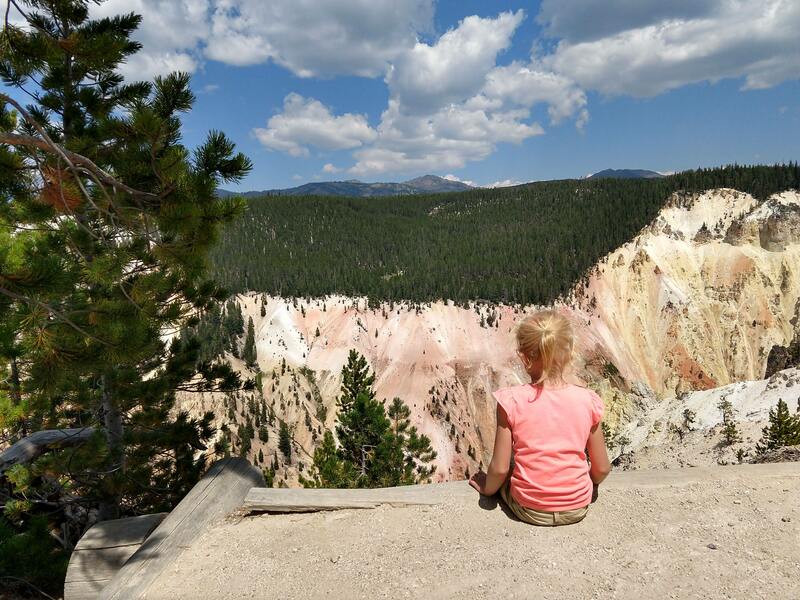 A friend of mine spent the summer working in Yellowstone last year (with her husband and four kids) and has lots of advice on her travel blog. Additionally, my brother-in-law grew up in Jackson, WY and had some good recommendations for the Tetons. Day one of our trip was a drive. It was supposed to be just a long, boring uneventful day driving through Wyoming. Life of course, had other plans. We had our car and roof box loaded to the gills (including 20 lbs of peaches we’d gotten from our fruit CSA) and were speeding along I-80 in WY at the prescribed speed of 80 mph. Suddenly there was a popping noise and the rear view window showed sleeping bags bouncing into the road. We pulled over quickly and discovered that the wind had somehow torn apart one of the hinges on the roof box. We sternly told the kids to stay in the car and jogged down the interstate to retrieve our things. Nothing gets your heart racing like running across a highway with semis barrelling down on you. It’s like one of those real life story problems: If a truck is approaching you from a distance of 1/4 mile and is traveling at a speed of 80 mph and you can run 10 mph will you survive? Luckily we did our math right. When we got back to the car, Ellen was really anxious and kept yelling at us to hurry and get in the car. Somewhere in my prior explanations about policeman pulling people over, she got it in her head that if a policeman came across us on the side of the road we would all be arrested. 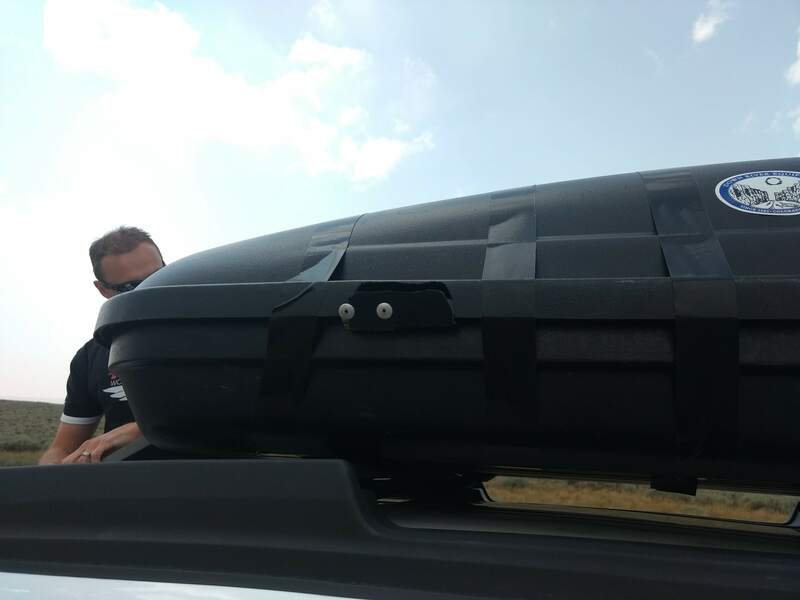 We assured her that wasn’t the case and took our time securing the roof box with a generous amount of Gorilla tape we fortunately had in the car. (Note to self: Buy more Gorilla tape and always keep in the car.) The rest of the trip to Yellowstone was mostly long and boring as anticipated with just a little bit of underlying anxiety that the Gorilla tape wouldn’t hold. We got into Yellowstone after dark and were joined by my parents. We had a leisurely breakfast and waited for my sister Hope and her family to join us. The kids were soooo excited to see their cousins. 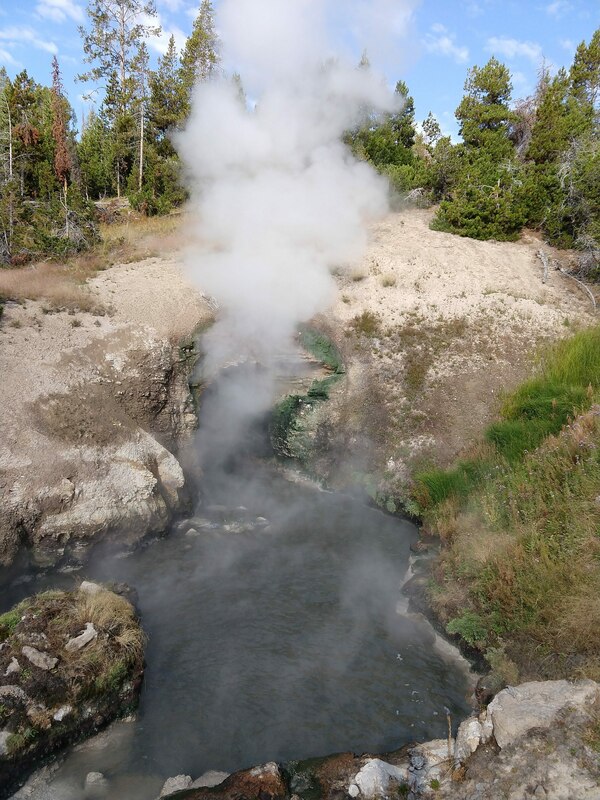 Once they arrived, we went and checked out West Thumb Geyser Basin. Cousins checking out the geyser basin. We were really enjoying all the beautiful and fascinating thermal pools when it began to pour rain and small hailstones. There was a mass exodus of the boardwalks as people ran for cover, including us. Noel with hail remnants clinging to his jacket. We headed back to camp and made a peach cobbler to celebrate Hope and Joe’s anniversary. The kids also enjoyed more quality cousin time. Peach cobbler in the making. Cooper and Theo holding hands. The Walkers had to head home at that point, work and all. 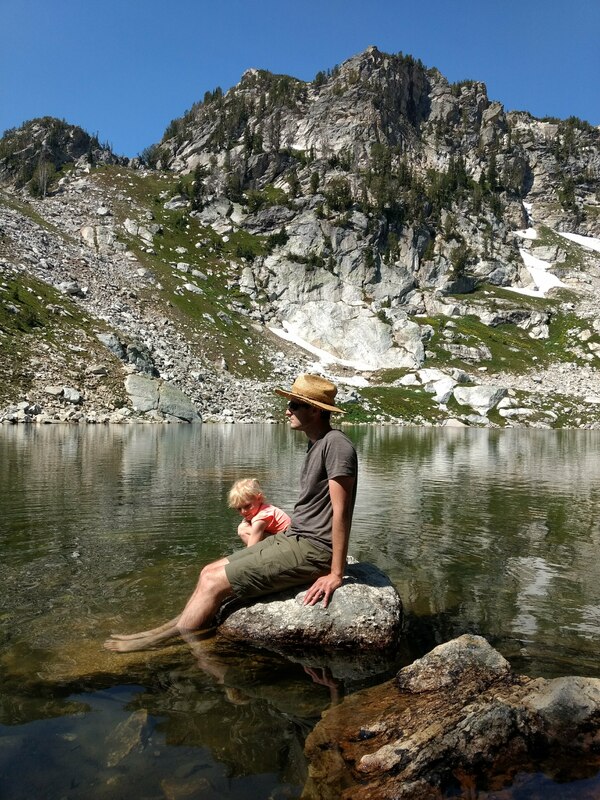 We thought we’d go on a little hike before dinner and headed to Riddle Lake. About 1/2 mile into the hike it started to thunder and we decided to turn back. Minutes later it began to rain and then hail again. We picked up the pace as the hailstones became larger. Noel used his body to shield Cooper and I covered Ellen and I with my backpack. My parents were on their own. The trail turned into a stream as we sloshed our way back to the car. Of course, it all ended a few minutes after we’d reached safety, but no one had a desire to go back out and try again. Noel and Cooper as the hail began. At that point we decided the weather was trying to tell us to just make dinner and call it a day. We got up early, loaded into the car and headed to the Fairy Falls trailhead. We brought breakfast and ate it at the trailhead, figuring it was better to dibs a spot and tailgate it. This was the part of the trip I was probably most excited about. 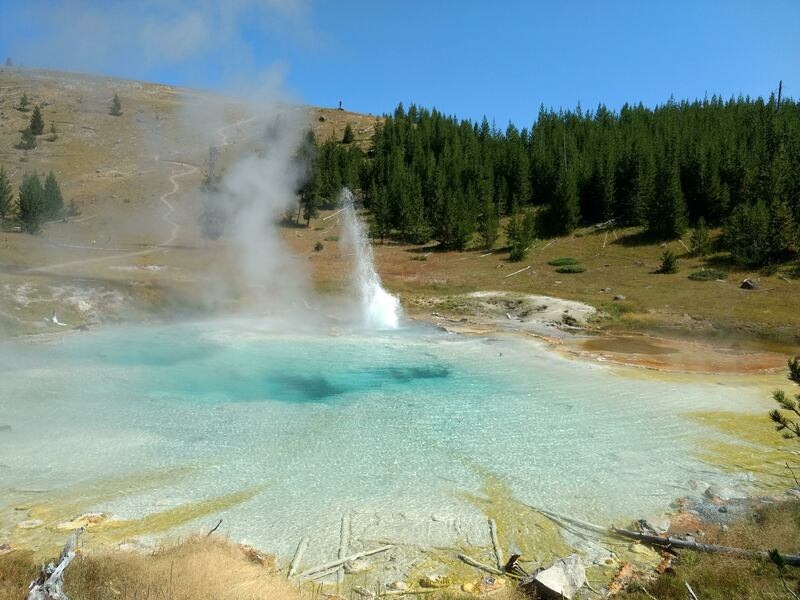 I’d read on Valerie’s blog that you could fit a lot of things into this hike – Grand Prismatic Springs, a waterfall, and two geysers which seemed like a lot for a hike under 10 miles. The only thing that disappointed about this hike was the lack of bathrooms at the trailhead (which I complained about excessively until about a mile in when the crowds thinned enough for me to sneak off into the trees). 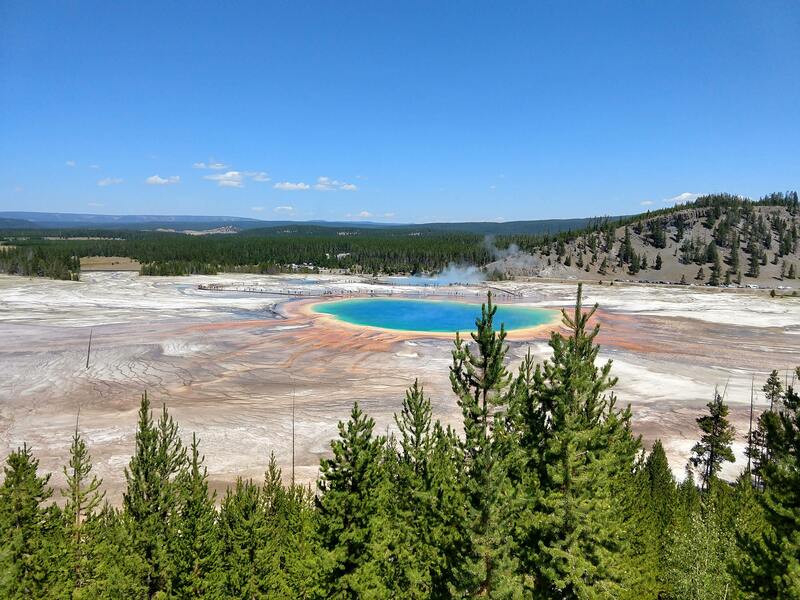 First up was Grand Prismatic Spring. Geyser steam is much harder to see through in the morning so you can’t see it very well in this photo, but we checked it out again on our way back to the car and got a much more impressive photo. The overlook was teeming with people which made me worried about the hike to Fairy Falls, but fortunately a lot fewer people were interested in hiking further. The hike to the Fairy Falls was a pleasant path through the forest and the fall was much bigger than I’d anticipated. I feel like the photo doesn’t quite do the height of the falls justice. Cooper and Ellen with Grandma Cindy. We continued on the trail after Fairy Falls to see Spray Geyser and Imperial Geyser. Imperial Geyser was probably my favorite geyser in Yellowstone. The color was beautiful and the crowds were minimal. For awhile we had the place to ourselves. The picture doesn’t completely capture the beautiful colors of the geyser (turquoise, orange, and white), but it was pretty cool. After our hike, we debated whether to try and find a parking spot at Artist’s Paint Pots. We decided to gamble and drove up there. We were fortunate to find two spots – one for us and one for my parents. 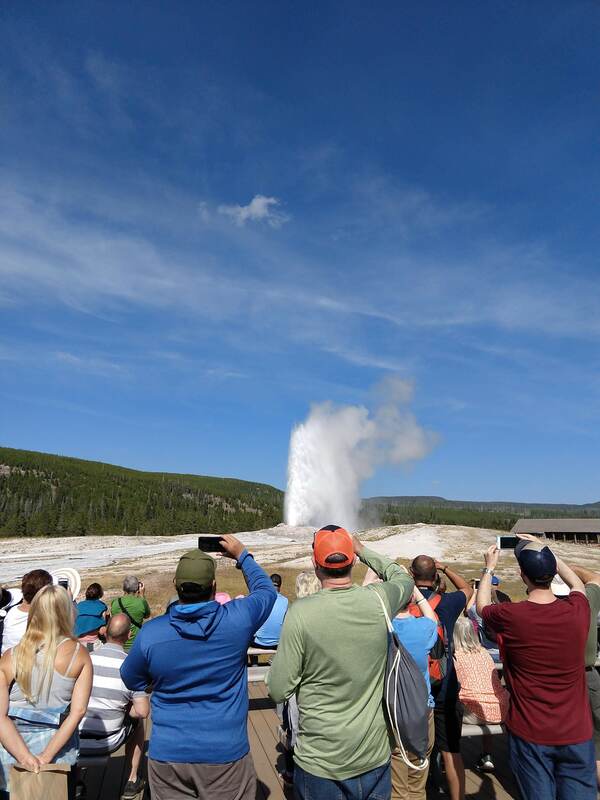 To finish off the day, we headed to Old Faithful. It had been at least 10 years since any of us had been there and it was shocking (although maybe it shouldn’t have been) how much the area had changed. The kids list Old Faithful as one of their favorite parts of the trip. We woke up early again and drove to the Mud Volcano area. The kids were grumpy (probably due to sleep deprivation, this is totally payback for the early years of their lives 😉 ),but still managed to come around on how cool it was. Bison crossing in front of our car. Vent Geyser – the sound of this one was the most impressive/unsettling part. 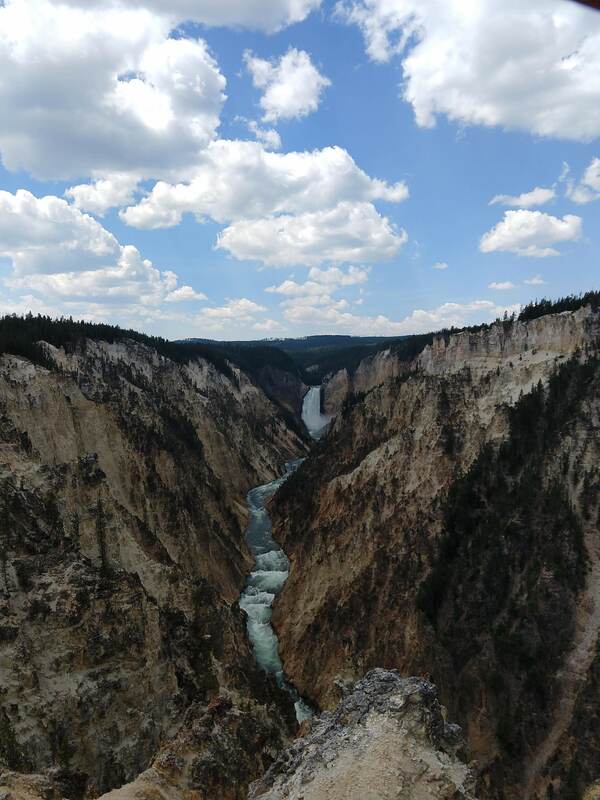 The Grand Canyon of the Yellowstone was another landmark I’d underestimated. I knew there was a waterfall and a canyon, but I wasn’t prepared for how, well, grand it all was. Posing in front of the Lowerfalls. Ellen climbing under logs on our hike. By the time we got back to Artist’s Point we were starting to get a bit testy with each other. I’m going to blame low blood sugar. We said goodbye to my parents who needed to head home and went to have a picnic lunch at the Visitor’s Center. 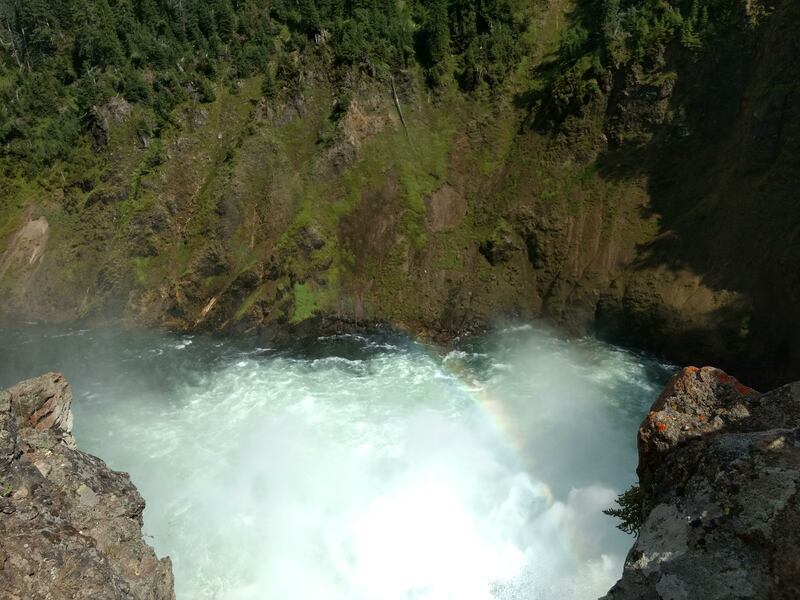 After obtaining sustenance we felt up to going and checking out the Brink of the lower falls. It was impressive to get that close to the fall. 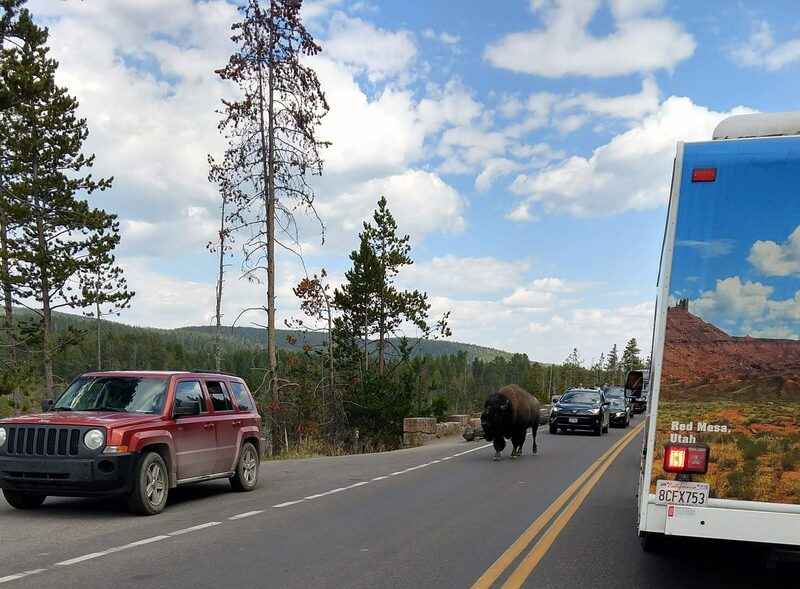 After that, we called it a day and headed back to camp, only to get stuck in bison photography traffic. 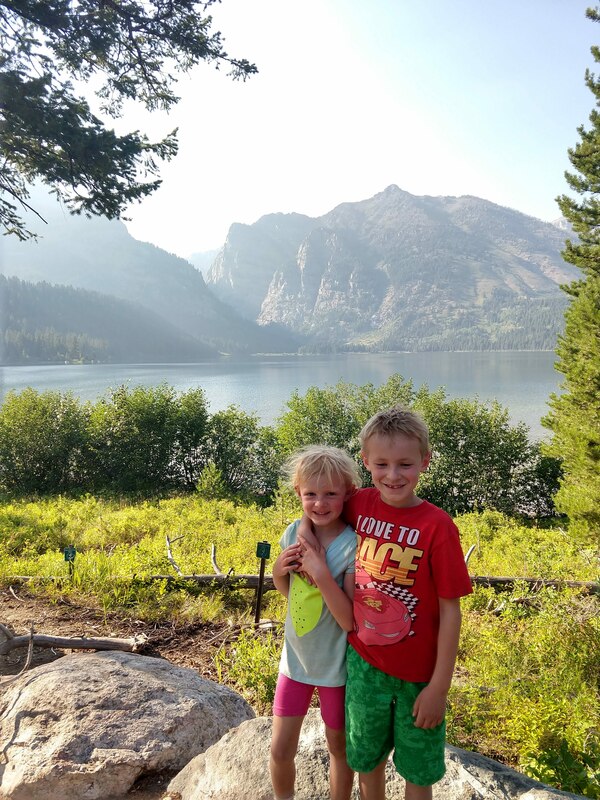 We woke early, broke camp, and drove to Grand Teton National Park. 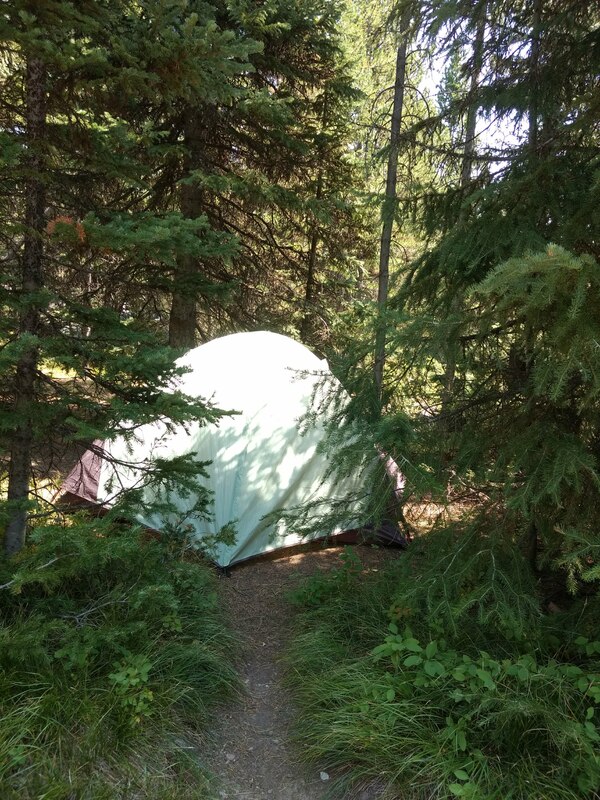 You can’t reserve campsites in Grand Teton so we wanted to make sure we got a site. (It was mid week so it was likely we’d get one, but we weren’t taking chances.) The camp host gave us what he termed “the best site in Colter Bay.” It was pretty nice. We had lots of trees, it was fairly-private, and close to a trail to the lake. We slept in and after a leisurely breakfast wandered over to the marina to rent a canoe. Apparently only three people can be in a canoe, so we had to rent two. (I may take this up with Coast Guard.) This meant more money, but also less muscle power per boat. (Unsurprisingly the kids are not helpful paddlers.) It was fun to explore by water, but we definitely got a workout in trying to get back within our two hour rental period. 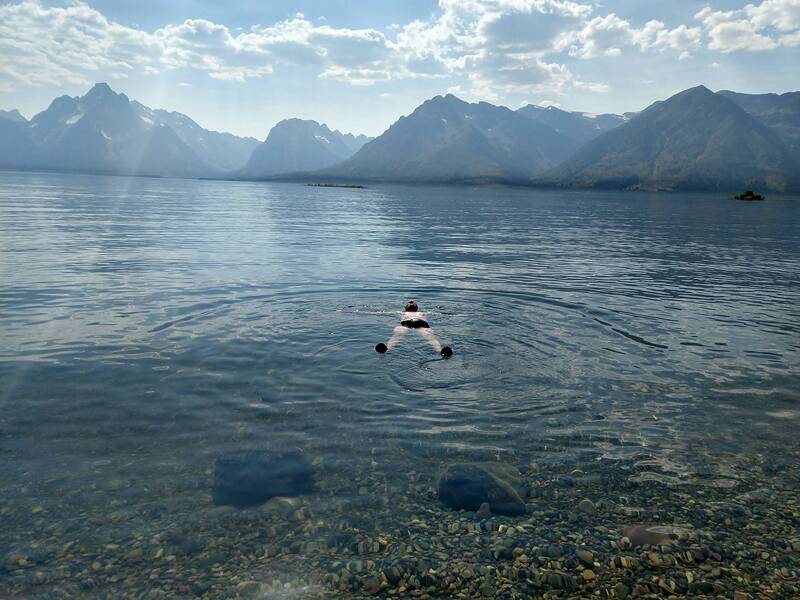 It was HOT in the Tetons (as my brother-in-law Joe said #globalwarmingisreal) so after we returned our boats we decided to go for a swim in the lake. 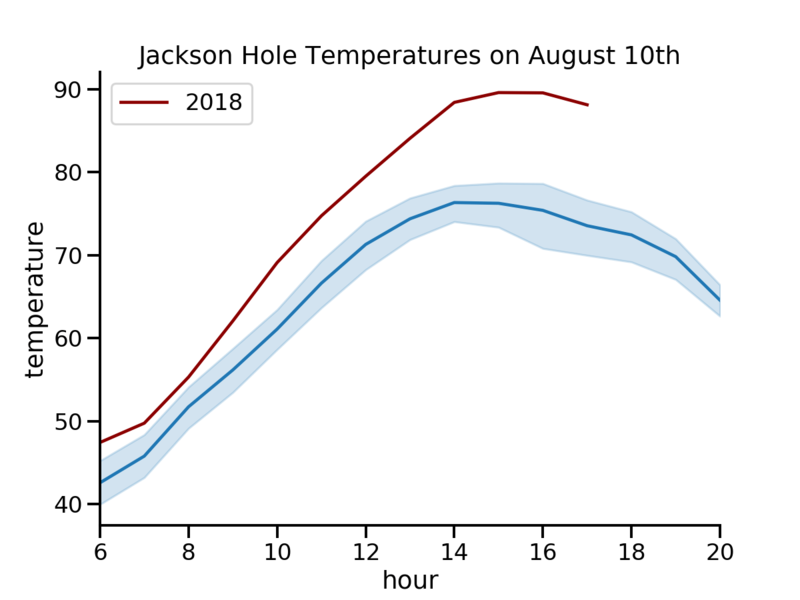 Noel made this graph just to illustrate how unusually hot it was. After cooling off, we headed to Laurance S. Rockefeller Preserve. Noel and I had visited it on our last trip to the Tetons when it was pretty new and not popular yet. Unfortunately, we didn’t make it in time to see the building (we were 5 minutes too late), but we still got to see the outside and went on a hike to Phelps Lake. Noel and I at Phelps. This was our big hiking day. We set an alarm so we could get out early enough. The kids were practically asleep when I wrestled them into their clothes and not particularly pleased. 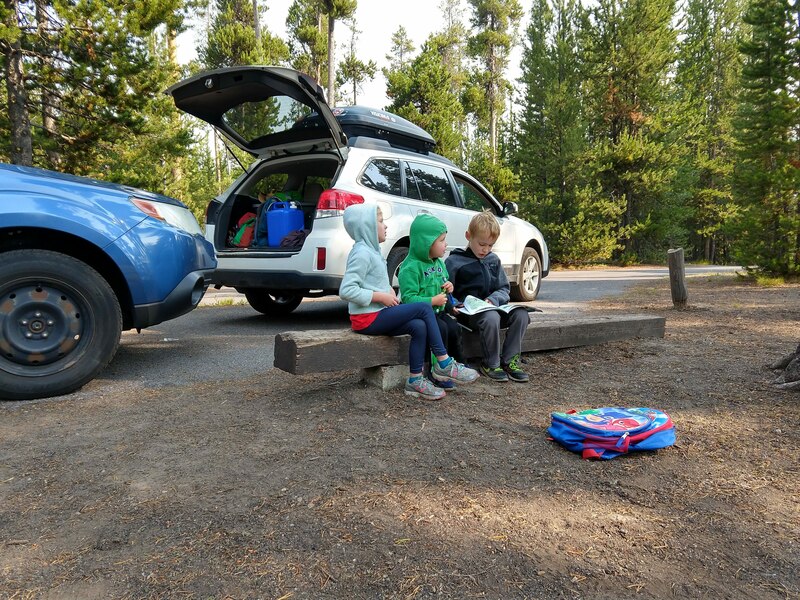 We placated them with donut holes on our drive to the Lupine Meadows Trailhead. The parking lot was already filling up both from hikers and backpackers on overnight trips and it wasn’t even 8am. 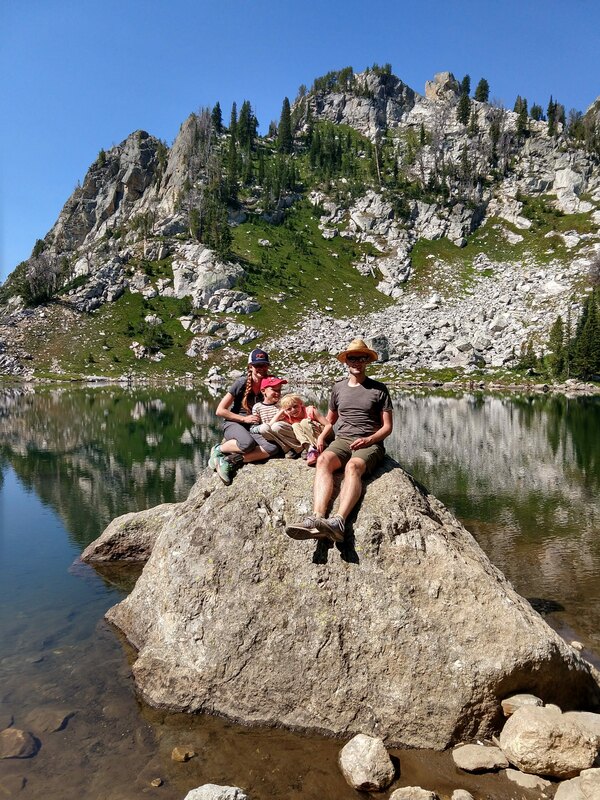 We took our time climbing the 5.2 miles to our destinations – Surprise and Amphitheater Lakes. Endless games of “I spy” counting down the switchbacks, and talks of our favorite things about school and summer occupied our time. For the most part, it was a pleasant, though strenuous hike. We’d planned well and were headed down the mountain in the heat of the day when many people were headed up. 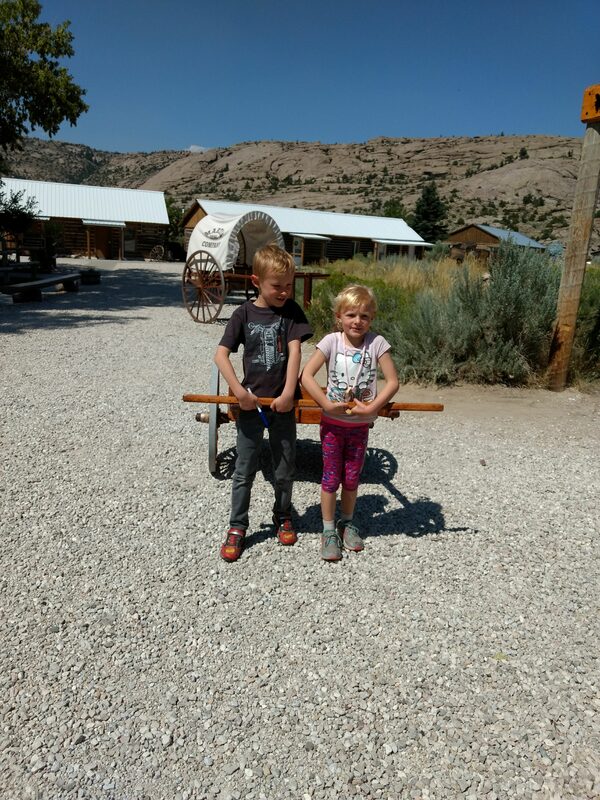 I’m unabashedly proud of how tough my kids are, but did worry that it was demoralizing for some of the hikers that were struggling in their ascent to be cheerfully greeted by us and our young children. (I did hear one woman giving her ragged looking group a pep talk about how if those kids could do it, they could do it.) 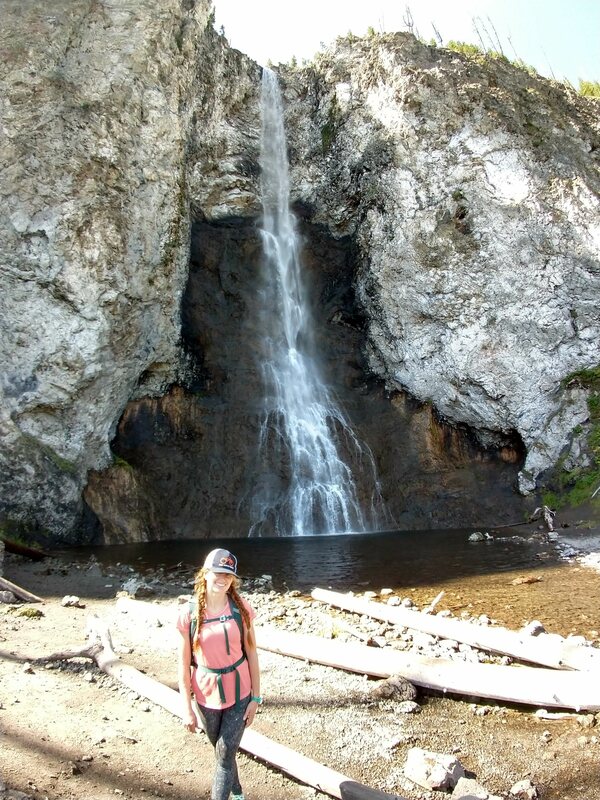 I added up all the miles from our hikes over the week and the kids hiked 28.5 miles. After the hike, we headed back to the lake, again, to cool off before hitting the showers. (We joked it was a public service because we were pre-rinsing ourselves.) Afterwards we treated ourselves to pizza. I’m not going to lie, it felt so fancy to eat in an air conditioned building. This was our last day, so we packed up camp, loaded up the car, and used the last of the Gorilla Tape on the roof box. Leaving was a bittersweet feeling. We were ready to not have the threat of a bear eating us if we didn’t wash our dishes, but we weren’t quite ready to go back to regular life’s demands. Ready or not, it was time to go. 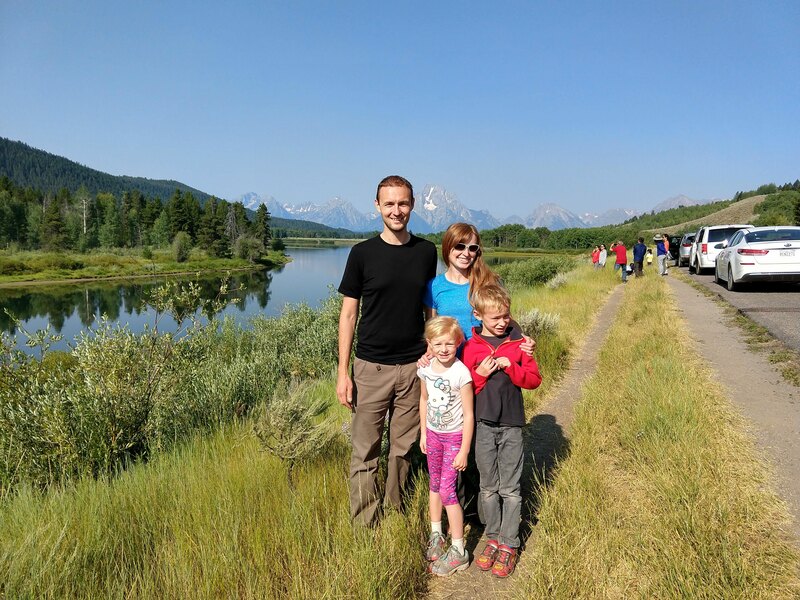 We stopped by Oxbow bend on our way out and snapped one last family photo. As we were driving, we decided to make a stop at Martin’s Cove, mostly because when else would we be that close. Noel and I both did church camps there as youth. While we both have mixed feelings about the tradition (historical reenactments can be kind of weird, but the experience seemed really impactful to a lot of people), it did stir up some emotions for us about our love for our ancestors and our religion. Now we are home and gearing up for school later this week. I’ve mentioned before that I feel like traveling shifts my perspective and nudges me to rethink the way I’m running my life. This time, I came back with the resolve to unplug a bit more and be more present. (Not having service was certainly a screen detox and showed how little I missed.) I also am resolving to be more patient and kind. I caught myself being testy a few times with family and strangers and I didn’t like it. (I’m sorry marina rental guy for getting testy with you about your canoe rental policies . . .) Here’s to the end of summer break and getting into a better swing of things. 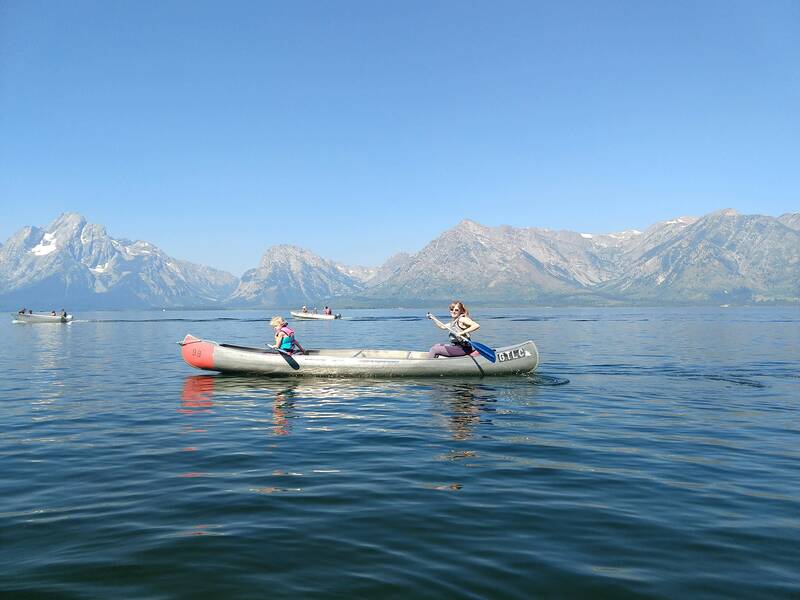 We love Yellowstone and the Tetons! It’s such a beautiful world! Duct tape would work for most applications. Gorilla Tape is just especially sticky and durable. So awesome! Perhaps someday I will be able to use your wisdom and do a trip like this for our family. I found your blog when I was searching the internet for an old friend. I was for a short time along time ago a good friend of Glenna’s. We were even room mates for a bit. My name is Debbie and I worked with Glenna at the Maxim hotel. I last saw Glenna when she was newly married and pregnant with her first child. We lost touch with each other, but I have always had fond memories of her and her offbeat take on life. I can still see her with her choppy blond hair and big 80’s glasses sitting on the couch eating marshmallow whip out of the jar. It was a long time ago and we were crazy young and pretty and trying to figure out how to handle life and men and who we wanted to be. I actually found her website a few years back and thought about reaching out to her, but did not know if she would remember me and I am sad to say I did not. So when I looked again for her and found your blog and read of her passing, it was a sad shock. But I am really happy to see that she has such a loving family, and that she was blessed to have such a wonderful young woman caring for her at the end. I just wanted to reach out to you and say thank you for all you did for her. It’s so nice to hear your remembrances, Debbie. Noel, my husband, is the baby Glenna would have been pregnant with. Glenna was indeed a special lady. Audrey, you did such a great job! Love your hair and E bike. John and I really enjoyed seeing all the pictures, miss you all!